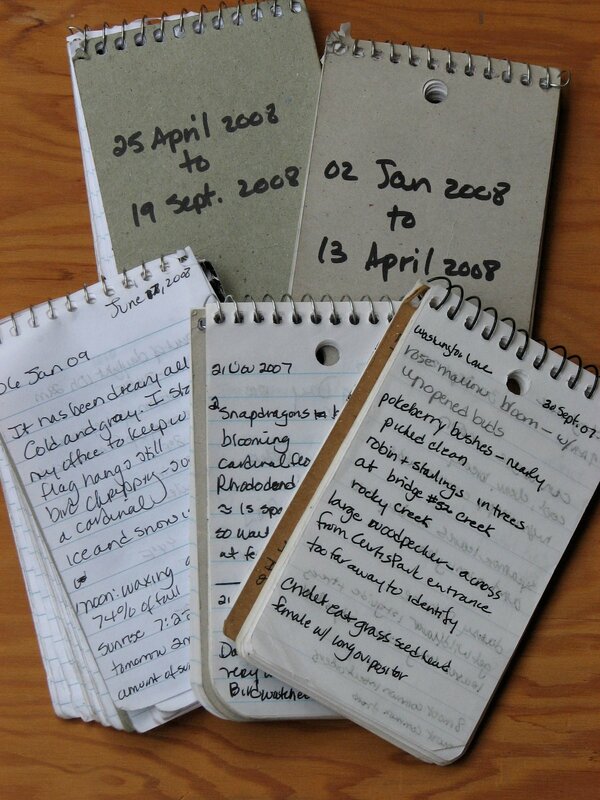 A field notebook is a small shirt-pocket-sized memo pad where you record your nature observations. It is carried on field trips, hikes and while sitting in your backyard. It is a handy way to record what you see and to always have something to write in your nature journal. I always have mine with me. I take mine on fast-moving birding walks with my Audubon group. I list birds seen and other observations. It is your primary note receptacle. It can contain all sorts of notes such as directions, nature observations, books to read, anything you want. Keeping it with you allows you to take notes while you are observing. Memories can be inaccurate. Later you may ask yourself was the hawk’s eye yellow or red? Had the American Goldfinch’s plumage turned from summer breeding to drab winter colors? A memo pad fills up quickly. I go through several each year. When you fill up one, file it away. From the memo pad a full account of your observations are written in the field journal.